There was a small queue at the mini-restaurant on Baltic Square, but I’m sure it would have been a lot busier if they had mentioned the kitchen was bring run by (the fabulous) The Feathers Inn! After an amusing introduction with a faux-drink drunk straight from the Tyne – Fentimans ginger beer and dandelion and burdock (brilliant idea/combination), we were told by our hostess that the theme behind the experience was that of upstream/downstream from Newcastle. 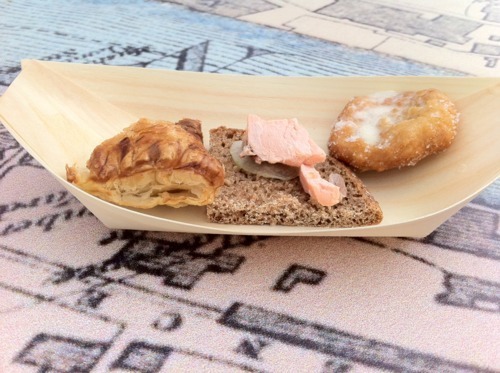 Our first host represented the upstream – ingredients from everywhere west of Newcastle – bites of salmon, roe deer and vegetable pasty and a local doughnut with gooseberry sauce. 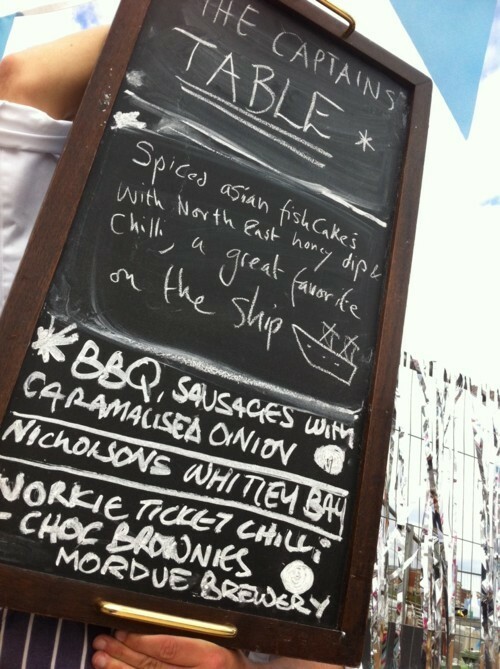 Delicious and local – served in little “boats” that we sent down the Tyne map overlaid on the table. 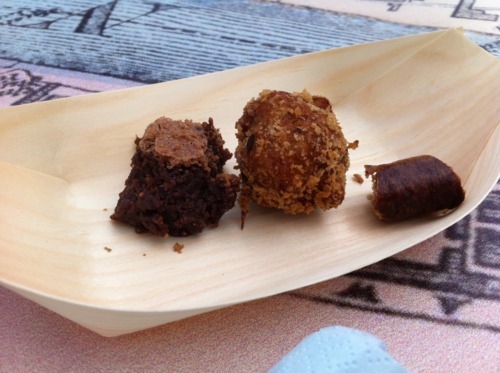 After ten minutes or so, we have downstream ingredients introduced by Lord Collingwood – caramelised onion sausage, Asian fishcakes, and a personal favourite, Workie Ticket chilli chocolate brownies – probably the best brownie I’ve ever had, gooey and wet inside, rich, chewy and chocolatey on top. The Feathers Inn didn’t even charge for this – only requesting a small cover charge. If anyone hasn’t been to The Feathers – I’d strongly recommend it (full review to follow). Definitely hope to see more events like this at next year’s event!